Is your child asking about following Jesus or baptism? We want to help you! Our kids baptism class is designed to help answer questions that kids have about baptism like what it is and why we do it. We want them to know the importance of this step of obedience and to know that they are following Jesus. One of the best parts of this class is that YOU, the parent, get to play an important role by actually leading some of the discussion with your child. We want to help you be prepared to talk about salvation and baptism…we want you to experience the joy of helping your own child to know and follow Jesus! To help with this we are going to have a Parent Orientation before the kids baptism class. At the orientation we will show you how the class will go and give you some resources to help you have a great conversation with your child. The Parent Orientation will be on Tuesday evening, February 26 at 6;45m in the Yellowstone Room. This orientation is for parents only. Childcare is available…kids birth-3 yrs will be in the nursery, 4yrs-5th Grade will be in 316. 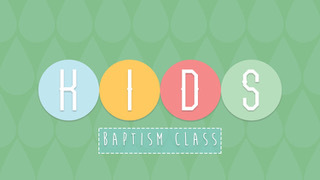 The Kids Baptism Class will be March 3 at 12:30pm in the Yellowstone Room and includes lunch. You only need to sign up once!